It is fair to say that I have amassed a fair amount of ‘stuff’ over the years. Some of it was bartered, some of it was bought and some of it was just picked up…quite literally. I have geodes from burning sands of Arabia and rocks from the frozen heights of the Himalayas, and in a drawer somewhere I have a bag of Saharan sand that I am not quite sure what I am ever going to do with. Maybe I’ll just take it back to the desert one day and release it back into the wild. Every piece though has a story attached to it. Hell, after 30 years, some of it might even be worth something! Three of my favourite pieces though are truly priceless, not in monetary value, but in the memories and stories attached to them. The first was given to me by a survivor of the 2004 Asian Tsunami. I was in Sri Lanka about 6 months after the Boxing Day tsunami, working with groups of volunteers helping with the rebuilding programme. I was based close to a small fishing village called Peraliya, which lay along the country’s southwestern coast. It had been one of the worst hit areas and the sense of loss and devastation still haunted the scattered remains of the village. The authorities claimed that 1,000 people had died here, but local aid workers and residents put the figure closer to 2,500. Many of its survivors still lived in tents or makeshift shelters and some, like Manjou, were crowded into small wooden shacks around which were gathered their few remaining possessions. Manjou could probably have been described as one of the lucky ones – he had survived after all – but his story was to become an all too familiar lament during my time there. The first wave had deprived him of his home, his job and, tragically, his younger sister. The second wave hit whilst he and his two brothers were out looking for her. That was the last time he ever saw them. Manjou was swept two kilometres inland by the force of the water and by the time he returned to his village everything he had ever known was gone. 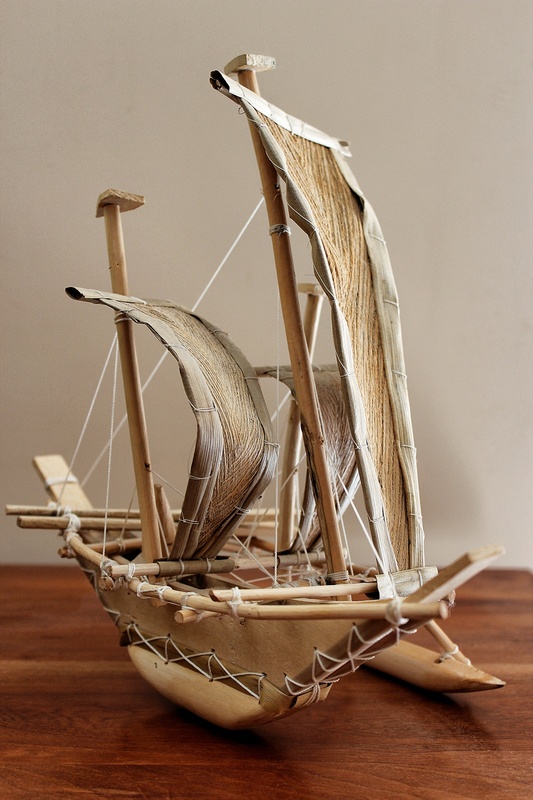 A qualified electrician, he had been reduced to spending his days making small wooden boats, which he sold to buy rice to feed what was left of his family. Over the course of six weeks I got to know Manjou quite well and regularly turned up at his shack with unwanted clothes and people eager to see his boats. He managed to sell every boat he ever made whilst I was there and on the day I left he presented me with this as a thank you. He wouldn’t accept any money for it and hugged me when I left. I never saw Manjou again. I wrote to him, but I never heard back. I hope he made it though. The second piece has probably had the longest journey. It came to me from the frozen wastes of the High Arctic, by way of an Inuit bone carver I met in Canada two years ago. Bob Kussy is one of the most remarkable characters that I have met in recent years. A man with an encyclopaedic knowledge of Inuit history and culture, he was married to a quite extraordinary woman who, it turned out, is also one of Canada’s most celebrated Inuit artists and an ambassador of Inuit art and culture around the world. I went to visit Bob as part of a photo essay that I was working on with a photographer friend. I was looking for an insight into Inuit life in the Canadian Arctic. What I ended up with was an incredibly personal and insightful introduction to two generations of Inuit history and culture. 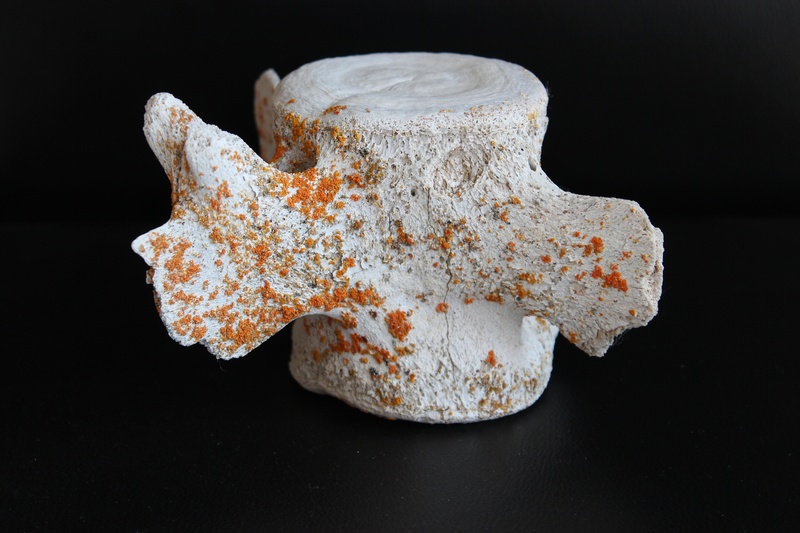 I also walked away with part of a whale’s spinal column…complete with polar bear teeth marks and lichen! Bob presented it to me as I was leaving, pulling it out of a bin under his workbench which contained what looked like a build your own whale kit. 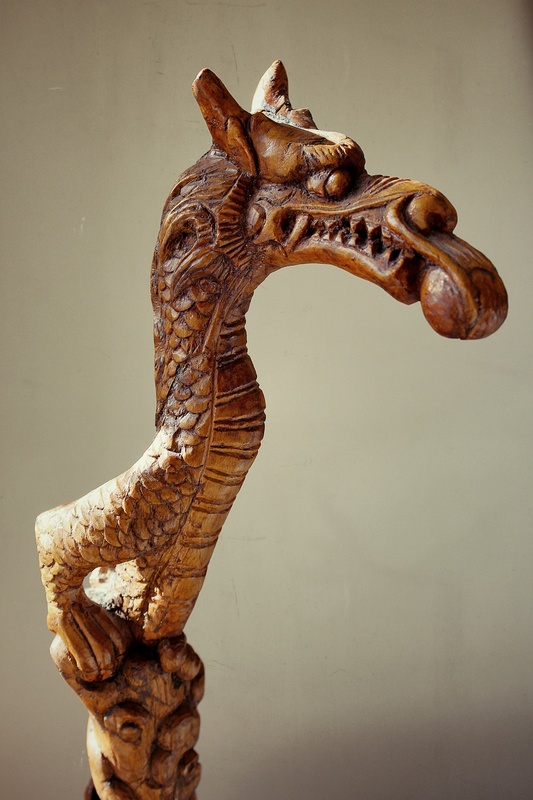 The final piece is a walking stick that I picked up in a market in southern China nearly 20 years ago. It is probably the least expensive thing I have ever bought on my travels, and yet it probably generates the most comment from everyone who sees it. Ironically, I never even intended to buy it. I made the schoolboy error of making eye contact with its previous owner, a fatal mistake which resulted in a chase through the streets and a panicked offer to buy at a ridiculously low price. And suddenly I found myself the owner of a three and a half foot dragon! I ended up sending it home by post from Hong Kong and was reunited with it, surprisingly, two years later. I think it cost me about £5 at the time and it still makes me smile every time I look at it. It has watched me disappear on countless adventures and its disapproving glare is usually the first thing I see when I walk back in again. Over the years it has become a sort of talisman, something that keeps drawing me back to those carefree days of adventure.